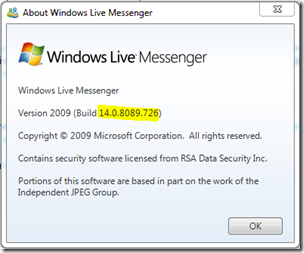 Microsoft will force an upgrade on Windows Live Messenger users in September to plug a hole the company introduced when a programmer added an extra character to a code library. "We are committed to providing a safe, secure and positive experience for our more than 300 million customers across the globe using Windows Live Messenger every month. To deliver on that commitment, beginning on August 25, we started asking our customers using versions 8.1, 8.5 and 14.0 to upgrade to the newest version of Messenger. The upgrade will provide customers with the latest software updates including code fixes and feature enhancements, as well address vulnerabilities discussed in the Microsoft Security Advisory 973882 that existed in previous versions of Windows Live Messenger...."